I am taking the opportunity on this post to share some photos of the various parts of the Jeep before I start digging too deeply into it. This will serve as the basis for a comparison from the start of this journey to what I have at the end of it all. Engine, right. Note garden hose oil overflow. To continue with the story, I knew that I had to repair the brakes. Obviously, the pedal's not supposed to go to the floor. Interestingly, since the pedals go through the floor on these old Willys, the master cylinder is accessible via the removal of an access panel on the floorboard. I pulled off the plate, and opened up the cylinder. I found it completely dry inside. I poured some DOT3 into it, and after about fifty pumps of the pedal with no level change, I realized that I was going to have to do more than the "basics" to get this project rolling. I started doing research on the Early CJ5 Forums. It turns out that this brake system suffers from what would be considered design flaws today, but were just par for the course back when this Jeep was new. The early CJs weren't really intended to be driven on today's highways. They were intended to be working vehicles on farms, or operated off-road at lower speeds than we are used to today. As a result, 9" drums and a single reservoir master cylinder proved more than adequate. Since this isn't an historic restoration, and safety and convenience are two of my goals, I decided to modify the stock system to a very popular upgrade. This consists of a replacement dual-reservoir master cylinder, so that a loss of pressure in the system doesn't mean complete brake system failure, and an upgrade to 11" drums all around. There is a gentleman named Herm The Overdrive guy on the InterWeb who sells kits to make the upgrade relatively simple, and to keep junkyard shopping trips to a minimum. So, I called Herm up and ordered the 11" upgrade kit and dual-reservoir master cylinder conversion kits from him. When they arrived, I was pleased to note the quality of the parts, but I was also a wee bit distraught after seeing what the installation was going to consist of. I am referring, of course, to the difficulty in accessing the stock master cylinder in its current location. I do want to keep the pedals through the floor, not for any other reason than I think it's cool, so relocation of the master cylinder to the firewall wasn't an option for me. Access from below wasn't any better. It quickly became obvious that I was going to have to dig deeper than I originally anticipated. It was time to start pulling off major chunks. Since these vehicles were intended to be serviced in the field, I knew that it wouldn't be that hard. With encouragement over the phone from my Uncle Terry, I dug in. I didn't just let the Jeep sit there untouched all those years I had it. About a year and a half ago, I decided to try and make a stab at getting it running, having very little idea of exactly what I was getting myself into. As a mechanical novice, I figured I would get the engine started and voila! But, as anyone who has a project Jeep knows, that was *REALLY* wishful thinking, and the kind of naivete that can get you in trouble, both physically and financially, in a real hurry. I figured, hey, I drove that thing up onto the trailer in New York twelve years ago. What could have changed since then? The initial plan of attack was getting fresh, clean fuel into the system. As I wasn't going after a full original restoration, I decided rather than mess around with the old tank, I would just order a new one. After doing a little bit of research, I purchased a plastic reproduction under-seat gas tank, replacement filler neck grommet and cap. When it arrived via Brown Santa, I tried fitting it in and was very disappointed to see that the neck wouldn't fit through the filler hole, and it sat in the tub cockeyed. I returned it for a metal tank. Originally, the thought in my feeble mind was that if I were to put in a plastic tank, I would never have to worry about replacement due to rust or whatever. What I hadn't fully processed is that the original tank lasted well over thirty years, and doing the math, I thought that with a little extra care, a metal tank should certainly last me the rest of my days. I wasn't able to get the old sender out of the top of the old fuel tank, as the screws had permanently mind-melded themselves in place. I ordered a replacement. In retrospect, that was lucky, as my Uncle Terry had converted it to 12V from 6V during the time he had it, and had just not bothered replacing the sender. So, the first time he started it up, the fuel level sender probably had a very brief bit of shock, and was then silent forever. So, new tank in place, I optimistically poured a gallon or two in. Turning on the ignition, I was delighted to see the fuel gauge needle move. That would be the extent of the positive events for that day. I sprayed a bit of starting fluid into the carb, and surprisingly, after a short time trying, she fired up! Well, I was so pleased, I decided to drive to the corner gas station and fill 'er up! (I lived in the city then, and it was only a few blocks). I hopped in, belted up, and started pulling forward. Just then, I had a thought which might have saved my skin, and certainly saved my insurance rating. I pushed down on the brake pedal just to make sure they were working. Blam, it went straight to the floor. Uh oh. I put it back in neutral, and hopped out. Wait, I smell gas. I looked underneath, and saw fuel dripping from the fitting which goes into the tank. I guess that fitting wasn't seated properly after all. I pulled it, and drained the fuel back into a gas can. I was defeated. Obviously, this wasn't going to be a simple fill 'er up, fluid swap, air the tires kinda project. I was in the middle of home renovations at that point, and so I wasn't able to really devote the time to the rebuild at that time, so I shelved it, until now. Now that I am in a new home, with very little on the "honey do" list for the most part, I decided I wasn't going to wait any longer. As some of you might know (or might not), I purchased a Jeep from my grandfather back in 1998. It is a 1956 Willys Jeep CJ5 "Universal". It has had quite a history in my family. My Uncle Terry purchased it in 1969 while stationed in Alaska in the U.S. Air Force. He's told me many stories of abusing this Jeep horribly during its younger days, but I digress. 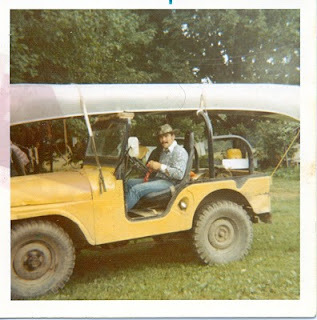 When my Uncle Terry left the good old USAF, he decided to drive this Jeep back to the family farm in upstate New York, which is about a 5,000 mile trip. I have done it, and back, and he and I even did it together several years back, but that's a story for another day. He took the western route through Canada, and encountered engine problems just outside of Seattle, Washington. It was there he purchased a 1955 Chevy, had a local weld on a towbar, and dragged the Willys all the way back to Lee Center. Back in those days, the G.I. Bill took a while to "kick in", as it were, and in order to start attending the State University of New York at Morrisville, my Uncle Terry asked my grandfather, Joe Bistrovich (may he rest in peace), to spot him the money for tuition and books. As "collateral", Grandpa asked Terry to sign over the Jeep to him. It was a win-win, as Terry needed the cash, and Grandpa needed a utility Jeep around his dairy farm. Well, when it came time for Terry to pay Grandpa back, apparently, Grandpa didn't want to give up the Jeep after all. So, he basically told Terry that they were even, and no worries. For years after that, Terry kept trying to buy the Jeep back from my grandfather, and he always refused. Fast forward to 1998. I fondly remembered my days as a child of riding in that Jeep to gather firewood. Or maybe just climbing around on the Willys, dreaming of someday driving it myself. So, in 1998, six years after leaving home for the Air Force myself, I decided to see if Grandpa would be willing to sell it to me. He agreed. My Uncle Terry was unaware of the deal I brokered, until I stopped by his house on the way back to Illinois with the Jeep on a trailer behind my truck. Needless to say, it was a "WTF" moment for him. Anyway, I got it back without incident, and have been sitting on it for the last twelve years, having done very little toward getting it back on the road again. In the coming months (and hopefully not years), I hope to document the modern rebuild of the Willys as much as I can on these pages. It isn't a restoration, as this Jeep is already well beyond modified already, and trying to take it back to "original, pristine condition" just isn't feasible. My goal is to make an adequate daily driver out of it, substituting modern upgrades whenever safety or convenience dictates. I hope that you might learn with me as I go about rebuilding nearly every system and subsystem of this 54 year old machine. I will be uploading lots of pictures and documenting the progress as it goes along. I look forward to this, and I hope that you will join me on my trip! And for those of you who might feel sorry for my Uncle Terry in all of this, he ended up purchasing another Jeep in the '70s... a 1949 Willys CJ3A. It's a gorgeous all-original flatfender, and it's been sitting up at the farm in one of the barns for quite a few years. I believe that my interest in getting the CJ5 project rolling has proven contagious, as he is in the beginning stages of starting to putter around with that one as well. If I get some pictures of that one, I will be sure to post them here as well.